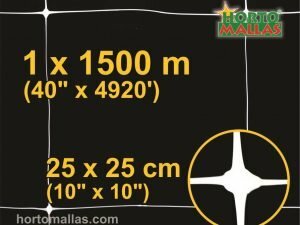 HORTOMALLAS allows melon growers to achieve a high density crop thanks to its vertical training of the plants. 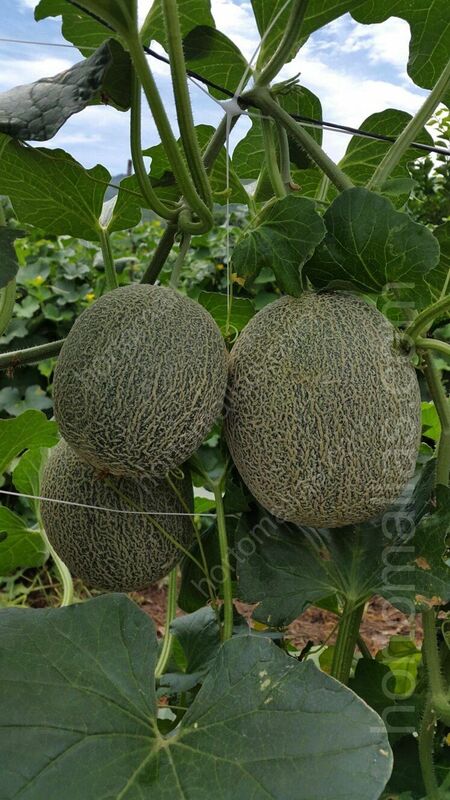 Training melons and watermelons to grow vertically is referred to as trellising and is one of the advantages of growing melons within a high tunnel using melon net. Most melon cultivars and personal size (<7 lbs.) 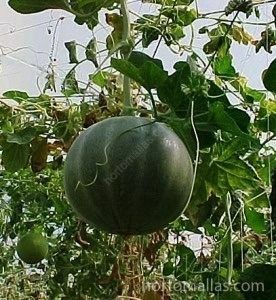 watermelon cultivars are amenable to trellising. Trellising improves light interception by the crop canopy, makes harvest easier, improves pollination and reduces damage to the vines during harvest. Trellising is necessary if the high tunnel is used to grow crops in addition to melons, since melon vines will overrun other plants if not trained. Various types of trellises can be used for high tunnel melons and watermelons (Figure 10). 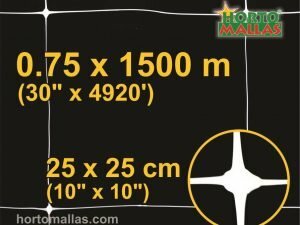 Using a trellis with a plastic (nylon) net (6” x 7” openings) that is approximately 72 inches high is a suitable trellis for pruned and unpruned vines. The trellis must be supported by a tensile wire, which runs parallel to the row and slightly higher than the trellis. 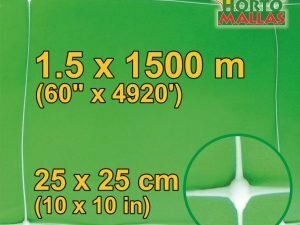 This wire can be secured to the frame of the high tunnel or attached to posts at each end of the row. The mesh trellis is in turn secured to the wire. The vines gradually grow up the trellis, using their tendrils to cling to the mesh trellis, but will require some training to keep the growth vertical. Assume the static load on the wire will be approximately 10-12 lbs per linear foot. Another form of trellis is an option when each vine has been pruned to one or two stems. Using a nylon string tied to a tensile wire 6-7 ft off the ground, the string is secured to the ground using anchor pins. The primary stem of the muskmelon plant is secured to the twine using plastic vine clips. As the vine continues to grow, it is clipped to the vertical twine. If the vine grows taller than the height of the trellis, it can be trained from the top down on another twine. 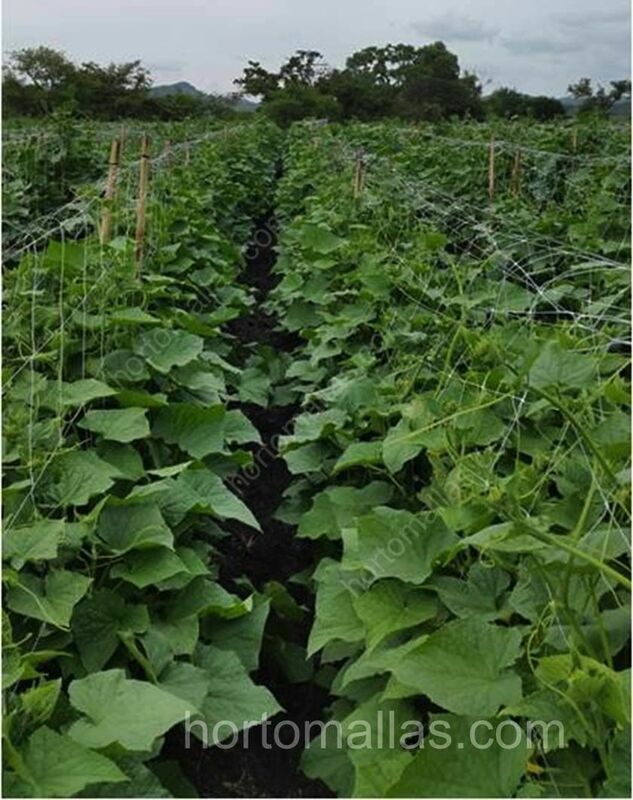 Woven wire fence or livestock panels can also be used as a trellis for Cucurbits. Fruit requires support as it grows on the trellis. 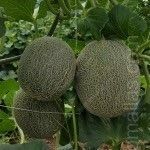 Some muskmelon cultivars have fruit with rigid peduncles (fruit stems) and may not need support. Small, mesh bags (onion sacks), cheesecloth or nylons can be used as slings to support the fruit (Figure 12). The bags can be tied to the trellis or the support wire. The bag should allow light penetration and not hold moisture. When the fruit is ripe, the bag can be cut from the trellis. 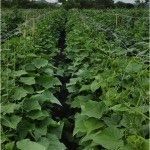 Melon grows safely when use trellis net for tutoring, avoiding the spread of disease and mistreatment of flowers by workers. Micro seedless (or seeded) watermelons can be trellised within a high tunnel. If so, the fruit must be supported. 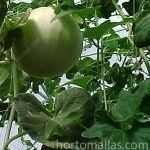 Other types of watermelons (large, seeded or seedless) can be grown without a trellis and left to vine throughout the high tunnel.